For other uses, see Trail of Tears (disambiguation). The Trail of Tears was a series of forced relocations of Native Americans in the United States from their ancestral homelands in the Southeastern United States, to areas to the west (usually west of the Mississippi River) that had been designated as Indian Territory. The forced relocations were carried out by government authorities following the passage of the Indian Removal Act in 1830. The relocated peoples suffered from exposure, disease, and starvation while en route to their new designated reserve, and many died before reaching their destinations. The forced removals included members of the Cherokee, Muscogee (Creek), Seminole, Chickasaw, and Choctaw nations, as well as their African slaves. The phrase "Trail of Tears" originates from a description of the removal of many Native American tribes, including the infamous Cherokee Nation relocation in 1838. In 1830, a group of Indians collectively referred to as the Five Civilized Tribes (the Cherokee, Chickasaw, Choctaw, Muscogee, and Seminole tribes) were living as autonomous nations in what would be later called the American Deep South. The process of cultural transformation,[clarification needed] as proposed by George Washington and Henry Knox, was gaining momentum, especially among the Cherokee and Choctaw. In 1831, the Choctaw became the first Nation to be removed, and their removal served as the model for all future relocations. After two wars, many Seminoles were removed in 1832. The Creek removal followed in 1834, the Chickasaw in 1837, and lastly the Cherokee in 1838. Some managed to evade the removals, however, and remained in their ancestral homelands; some Choctaw are living in Mississippi, Creek in Alabama and Florida, Cherokee in North Carolina, and Seminole in Florida. A small group of Seminole, fewer than 500, evaded forced removal; the modern Seminole Tribe of Florida is descended from these individuals. A small number of non-Native Americans who lived with the tribes, including some of African descent (including over 4,000 slaves, and others as spouses or freedmen), also accompanied the Indians on the trek westward. By 1837, 46,000 Indians from the southeastern states had been removed from their homelands, thereby opening 25 million acres (100,000 km2) for predominantly European settlement. Andrew Jackson did not listen to the Supreme Court mandate barring Georgia from intruding on Cherokee lands. He feared that enforcement would lead to open warfare between federal troops and the Georgia militia, which would compound the ongoing crisis in South Carolina and lead to a broader civil war. Instead, he vigorously negotiated a land exchange treaty with the Cherokee. Political opponents Henry Clay and John Quincy Adams, who supported the Worcester decision, were outraged by Jackson's refusal to uphold Cherokee claims against the state of Georgia. 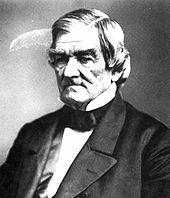 [full citation needed] Ralph Waldo Emerson wrote an account of Cherokee assimilation into the American culture, declaring his support of the Worcester decision. 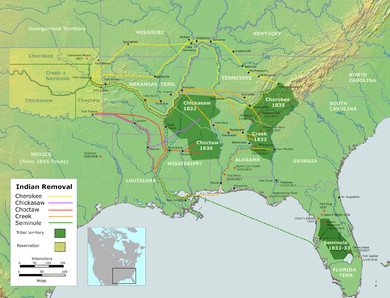 Jackson chose to continue with Indian removal, and negotiated the Treaty of New Echota, on December 29, 1835, which granted Cherokee two years to move to Indian Territory (modern Oklahoma). Only a fraction of the Cherokees left voluntarily. The U.S. government, with assistance from state militias, forced most of the remaining Cherokees west in 1838. The Cherokees were temporarily remanded in camps in eastern Tennessee. In November, the Cherokee were broken into groups of around 1,000 each and began the journey west. They endured heavy rains, snow, and freezing temperatures. Native Americans who had the means initially provided for their own removal. 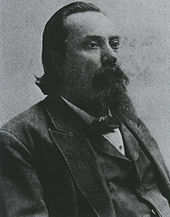 Contingents that were led by conductors from the U.S. Army included those led by Edward Deas, who was claimed to be a sympathizer for the Cherokee plight. The largest death toll from the Cherokee forced relocation comes from the period after the May 23, 1838 deadline. This was at the point when the remaining Cherokee were rounded into camps and pressed into oversized detachments, often over 700 in size (larger than the populations of Little Rock or Memphis at that time). Communicable diseases spread quickly through these closely quartered groups, killing many. These contingents were among the last to move, but following the same routes the others had taken; the areas they were going through had been depleted of supplies due to the vast numbers that had gone before them. The marchers were subject to extortion and violence along the route. In addition, these final contingents were forced to set out during the hottest and coldest months of the year, killing many. Exposure to the elements, disease and starvation, harassment by local frontiersmen, and insufficient rations similarly killed up to one-third of the Choctaw and other nations on the march. Other warchiefs such as Halleck Tustenuggee, Jumper, and Black Seminoles Abraham and John Horse continued the Seminole resistance against the army. The war ended, after a full decade of fighting, in 1842. The U.S. government is estimated to have spent about $20,000,000 on the war, at the time an astronomical sum, and equal to $519,241,379 today. Many Indians were forcibly exiled to Creek lands west of the Mississippi; others retreated into the Everglades. In the end, the government gave up trying to subjugate the Seminole in their Everglades redoubts and left fewer than 500 Seminoles in peace. Other scholars state that at least several hundred Seminoles remained in the Everglades after the Seminole Wars. Selocta (or Shelocta) was a Muscogee chief who appealed to Andrew Jackson to reduce the demands for Creek lands at the signing of the Treaty of Fort Jackson. Jackson opened this first peace session by faintly acknowledging the help of the friendly Creeks. That done, he turned to the Red Sticks and admonished them for listening to evil counsel. For their crime, he said, the entire Creek Nation must pay. He demanded the equivalent of all expenses incurred by the United States in prosecuting the war, which by his calculation came to 23,000,000 acres (93,000 km2) of land. Eventually, the Creek Confederacy enacted a law that made further land cessions a capital offense. 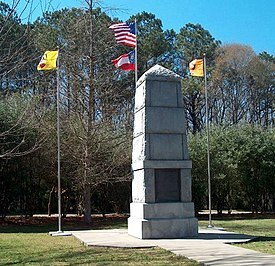 Nevertheless, on February 12, 1825, McIntosh and other chiefs signed the Treaty of Indian Springs, which gave up most of the remaining Creek lands in Georgia. After the U.S. Senate ratified the treaty, McIntosh was assassinated on April 30, 1825, by Creeks led by Menawa. The Chickasaw received financial compensation from the United States for their lands east of the Mississippi River. 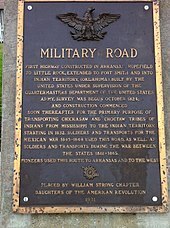 In 1836, the Chickasaws had reached an agreement to purchase land from the previously removed Choctaws after a bitter five-year debate. They paid the Choctaws $530,000 (equal to $12,092,030 today) for the westernmost part of the Choctaw land. The first group of Chickasaws moved in 1836 and was led by John M. Millard. The Chickasaws gathered at Memphis on July 4, 1836, with all of their assets—belongings, livestock, and slaves. Once across the Mississippi River, they followed routes previously established by the Choctaws and the Creeks. Once in Indian Territory, the Chickasaws merged with the Choctaw nation. In the winter of 1838 the Cherokee began the 1,000-mile (1,600 km) march with scant clothing and most on foot without shoes or moccasins. The march began in Red Clay, Tennessee, the location of the last Eastern capital of the Cherokee Nation. Because of the diseases, the Indians were not allowed to go into any towns or villages along the way; many times this meant traveling much farther to go around them. After crossing Tennessee and Kentucky, they arrived at the Ohio River across from Golconda in southern Illinois about the 3rd of December 1838. Here the starving Indians were charged a dollar a head (equal to $23.53 today) to cross the river on "Berry's Ferry" which typically charged twelve cents, equal to $2.82 today. They were not allowed passage until the ferry had serviced all others wishing to cross and were forced to take shelter under "Mantle Rock", a shelter bluff on the Kentucky side, until "Berry had nothing better to do". Many died huddled together at Mantle Rock waiting to cross. Several Cherokee were murdered by locals. The Cherokee filed a lawsuit against the U.S. Government through the courthouse in Vienna, suing the government for $35 a head (equal to $823.48 today) to bury the murdered Cherokee. ^ "Trail of Tears - Native American History - HISTORY.com". History.com. Archived from the original on October 14, 2017. Retrieved October 17, 2017. ^ "A Brief History of the Trail of Tears". www.cherokee.org. Archived from the original on October 18, 2017. Retrieved October 17, 2017. ^ "The Trail of Tears". PBS. Archived from the original on June 27, 2017. Retrieved October 17, 2017. ^ Minges, Patrick (1998). "Beneath the Underdog: Race, Religion, and the Trail of Tears". US Data Repository. Archived from the original on October 11, 2013. Retrieved January 13, 2013. ^ "Indian removal". PBS. Archived from the original on April 18, 2010. Retrieved October 17, 2017. ^ a b Thornton, Russell (1991). "The Demography of the Trail of Tears Period: A New Estimate of Cherokee Population Losses". In William L. Anderson. Cherokee Removal: Before and After. pp. 75–93. ^ a b Curtis, Nancy C. (1996). Black Heritage Sites. United States: ALA Editions. p. 543. ISBN 0-8389-0643-5. ^ a b Prucha, Francis Paul (1995-01-01). The Great Father: The United States Government and the American Indians. U of Nebraska Press. pp. 241 note 58. ISBN 0803287348. ^ a b Ehle, John (2011-06-08). Trail of Tears: The Rise and Fall of the Cherokee Nation. Knopf Doubleday Publishing Group. pp. 390–392. ISBN 9780307793836. ^ a b Carter, Samuel (1976). Cherokee sunset: a nation betrayed : a narrative of travail and triumph, persecution and exile. Doubleday. p. 232. ISBN 9780385067355. ^ a b c "Indian removal 1814 - 1858". PBS. Archived from the original on April 18, 2010. Retrieved October 18, 2017. ^ The new history of Florida. Gannon, Michael, 1927-2017. Gainesville, FL: University Press of Florida. 1996. pp. 183–206. ISBN 0813014158. OCLC 32469459. ^ Wallace, Anthony (2011). The Long, Bitter Trail: Andrew Jackson and the Indians. ^ a b Howe, Daniel Walker (2007). What Hath God Wrought: The Transformation of America, 1815-1848. ^ Morris, Michael (2007). "Georgia and the Conversation over Indian Removal". Georgia Historical Quarterly. 91 (4): 403–423. Archived from the original on February 16, 2018. Retrieved February 15, 2018. "Worcester v. Georgia". Oyez. Archived from the original on January 22, 2017. Retrieved February 5, 2017. ^ a b c Miles, Edwin A (November 1973). "After John Marshall's Decision: Worcester v Georgia and the Nullification Crisis". The Journal of Southern History. ^ Cave, Alfred. "Abuse of Power: Andrew Jackson and the Indian Removal Act of 1830". ^ Frey, Rebecca Joyce (2009). Genocide and International Justice. Infobase Publishing. pp. 128–131. ISBN 978-0816073108. Retrieved December 16, 2016. Emerson, Ralph Waldo. "Letter to Martin Van Buren President of the United States 1836". www.cherokee.org/. Archived from the original on June 17, 2016. Retrieved June 14, 2016. ^ a b c "Trail of Tears". History Channel. Archived from the original on December 14, 2014. Retrieved December 15, 2014. ^ a b Baird, David (1973). "The Choctaws Meet the Americans, 1783 to 1843". The Choctaw People. United States: Indian Tribal Series. p. 36. ASIN B000CIIGTW. ^ Groneman 2005, p. 97. ^ Harkins, George (1831). "1831 - December - George W. Harkins to the American People". Archived from the original on May 27, 2006. Retrieved April 23, 2008. ^ Sandra Faiman-Silva (1997). Choctaws at the Crossroads. University of Nebraska Press. p. 19. ISBN 978-0803269026. 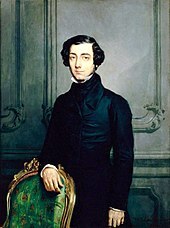 ^ de Tocqueville, Alexis (1835–1840). "Tocqueville and Beaumont on Race". Archived from the original on May 13, 2008. Retrieved April 28, 2008. ^ Davis, Ethan. "An Administrative Trail of Tears: Indian Removal". American Journal of Legal History 50, no. 1 (2008): 65–68. Accessed December 15, 2014. "Archived copy". JSTOR 25664483. ^ Oklahoma State University Library. "Indian Affairs: Laws and Treaties. Vol. 2, Treaties". Digital.library.okstate.edu. Archived from the original on January 6, 2009. Retrieved January 25, 2009. ^ Indian Affairs: Laws and Treaties. Vol. 2, Treaties. Oklahoma State University Library. Archived from the original on September 22, 2017. Retrieved October 18, 2017. ^ Oklahoma State University Library. "Indian Affairs: Laws and Treaties. Vol. 2, Treaties". Digital.library.okstate.edu. Archived from the original on January 8, 2009. Retrieved January 25, 2009. ^ "A Brief History of the Trail of Tears". www.cherokee.org. Archived from the original on October 18, 2017. Retrieved October 18, 2017. ^ Hill, Sarah H. (2011). "'To Overawe the Indians and Give Confidence to the Whites': Preparations for the Removal of the Cherokee Nation from Georgia". Georgia Historical Quarterly. 95 (4): 465–497. Archived from the original on February 15, 2018. Retrieved February 14, 2018. ^ "The Trail of Tears in Southern Illinois" (PDF). US Forest Service. Archived (PDF) from the original on September 24, 2015. Retrieved April 7, 2015. ^ Rush, Linda (November 10, 2011). "The Cherokee Nation in Southern Illinois". The Southern Illinoisan. Archived from the original on December 10, 2015. Retrieved April 7, 2015. ^ Corlew, Robert Ewing (1990). Tennessee: A Short History. University of Tennessee Press. p. 153. ISBN 0-87049-647-6. Eastern Band of the Cherokee Indians. "Cherokee Heritage Trails". Museum of the Cherokee Indian. Archived from the original on November 1, 2010. Retrieved August 16, 2010. Hooper, Ed. "Chief John Ross". Tennessee History Magazine. Archived from the original on May 22, 2010. Retrieved August 16, 2010. ^ "Top 25 American Indian Tribes for the United States: 1990 and 1980". U.S. Bureau of the Census. August 1995. Archived from the original on November 26, 2011. ^ Russell Thornton (1 June 1992). "The Demography of the Trail of Tears Period: A New Estimate of Cherokee Population Losses". In William L. Anderson. Cherokee Removal: Before and After. University of Georgia Press. p. 85. ISBN 978-0-8203-1482-2. ^ a b Francis Paul Prucha (1 January 1995). The Great Father: The United States Government and the American Indians. U of Nebraska Press. p. 233. ISBN 0-8032-8734-8. ^ Francis Paul Prucha (1995). The Great Father: The United States Government and the American Indians. University of Nebraska Press. pp. 241 note 58. ISBN 0-8032-8734-8. Retrieved 16 February 2016. John Ehle (1989). Trials of Tears: The Rise and Fall of the Cherokee Nation. Anchor Books. pp. 390–392. ISBN 978-0-385-23954-7. Retrieved 16 February 2016. William L. Anderson (1992). Cherokee Removal: Before and After. University of Georgia Press. pp. 75–93. ISBN 978-0-8203-1482-2. Retrieved 16 February 2016. ^ "Trail of Tears: History & Culture". National Park Service. Archived from the original on February 27, 2015. Retrieved July 8, 2012. ^ "Geographic Resources Division". National Park Service. Archived from the original on October 18, 2017. Retrieved October 18, 2017. ^ "Unto These Hills Drama - Cherokee Historical Association". 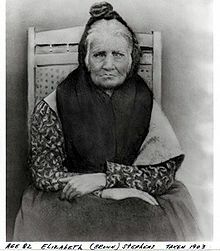 www.cherokeehistorical.org. Archived from the original on October 18, 2017. Retrieved October 18, 2017. ^ "Cherokee Ancestry". www.aboutcherokee.com. Archived from the original on October 18, 2017. Retrieved October 18, 2017. ^ "Cherokees to Mark Anniversary of "Trail of Tears" to Oklahoma". News OK. Archived from the original on April 2, 2015. Retrieved March 11, 2015. Anderson, William, ed. (1991). Cherokee Removal: Before and After. Athens, Georgia: University of Georgia Press. ISBN 978-0-8203-1482-2. Mooney, James (2007) . King, Duane, ed. Myths of the Cherokee. New York: Barnes & Noble. ISBN 978-0-7607-8340-5. U.S. Senate (April 15–17, 1830). Cherokee Indian Removal Debate. Archived from the original on February 6, 2009. Scott, Winfield (May 10, 1838). Winfield Scott's Address to the Cherokee Nation. Archived from the original on October 6, 2008. Gen. Winfield Scott's Order to U.S. Troops Assigned to the Cherokee Removal. Cherokee Agency. May 17, 1838. Archived from the original on December 27, 2008. Wikimedia Commons has media related to Trail of Tears.